The Americans’ soundtrack has a few recurring characters. There’s Pete Townshend, whose invaluable contribution to The One Where Elizabeth Wails On A Dude With A Paper Towel Dispenser was followed up by an original composition in season two. Yazoo/Yaz played a big role in season three, as the musical glue in Philip’s uncomfortable relationship with teenage contact Kimmy. And let’s not forget Fleetwood Mac, that eternal symbol of marital strife who helped establish the sound of the show (though, let’s not also forget: Quarterflash is actually the first band heard on The Americans) and whose presence means the Jennings are about to shove someone into an automobile. Just try to listen to “The Chain” these days without watching over your shoulder for a panel van. Paige has been in on her parents’ secret long enough that they’ve begun to fill her in on the finer details, sharing training regimens and field techniques and the basics of the Eckert mission. But at this point she knows as much about Philip and Elizabeth’s work as we did the last time we heard Roxy Music on The Americans. It isn’t until “The Midges” that she thinks to ask about assuming other identities for their missions—but they don’t give her much of an answer there. It’s probably for the best: Dealing with the idea of her home country tampering with another nation’s food supply is enough. (Kudos to Holly Taylor for the incredulous “What?” that follows this news.) She probably doesn’t need to think about police sketches of her mom and dad hanging up in Stan Beeman’s office. “The Midges” is all about psychological tolls. The Morozov mission is advanced slightly, but the episode’s momentum is largely interior. It’s written on the faces of the cast, from the darting eyes at Gabriel’s kitchen table to Philip’s reflection as he thinks back to a previous period of famine in the motherland. Its biggest shock comes from a face, too: Martha’s, after the camera lingering on Oleg’s grocery-store visit catches her puzzling over product labels. (The good news is Martha’s alive. The bad news is she’s combing the barren shelves of a store that’s under investigation for bribery.) When Paige casts a downward glance into a slice of pizza, Matthew Beeman can tell something’s up—realizing Elizabeth and Philip’s worst fears about their daughter’s new relationship. She keeps herself grounded with the finger-rubbing method, but that only stacks lies on top of other lies. “Everybody does.” This internal conflict is just the latest result of the ingenious story engine at the center of The Americans, the one that takes the stuff of everyday family life, runs it through the mechanisms of a spy narrative, and makes high-stakes drama out of it. 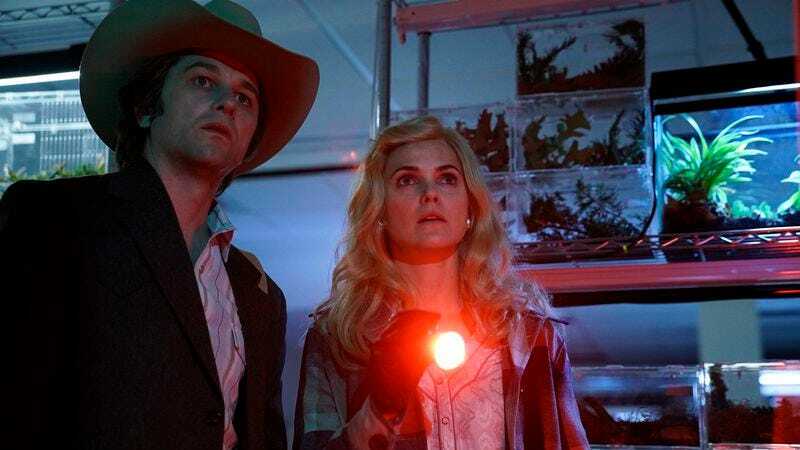 It helps that there’s a vast supply of these types of stories, but The Americans continues to be attuned to the ones that make the most sense for the Jennings and their progression through four-plus seasons. The anxiety about Matthew is the worry any parent might feel about their kid’s first significant other—it’s just that this significant other presents the risk of exposing his girlfriend’s parents as Soviet spies. The only reason Paige knows about the mission to Oklahoma is because of the tension between the Morozovs, a marital spat with the heft of massive international trade law violations. When Elizabeth reframes Paige’s concerns as a fundamental element of every romantic relationship, she’s doing the same thing the Americans writers have been doing all along. These ideas are best used as subtext, but that scene in the laundry room is proof that the well isn’t running dry. “The Midges” is a bit of a slippery episode. It’s a great collection of scenes—“great” in terms of quality and number—but it’s hard to pin down the connective tissue between them. I guess it’s a certain sense of dread hanging over the proceedings, whether it’s Oleg listening to the incriminating cassette tape or Mischa standing by helpless as he’s shaken down by a stranger who doesn’t seem eager to help get him out of Yugoslavia. Alexi’s anti-Soviet screeds are sticking with Philip, bound together by his memories of being a hungry child and Tuan’s anecdote about scavenging for food among the garbage in Vietnam. The finale at the lab is almost necessary for breaking the episode out of its funk—and it’s not outside the realm of possibilities that Philip and Elizabeth take such extreme measures with poor Randy Chilton because they’re taking these acts of agroterrorism personally. And that doesn’t bode well for Alexi Morozov. His odds of survival aren’t helped by Tuan’s disdain for Alexi, the spite in Ivan Mok’s voice growing more apparent with every passing mention of his “friend’s” father. And I don’t want to wade too far into speculative territory, but: “More Than This” is also playing under the Morozov’s bowling outing with the Eckerts. Probably best not to turn his back on Philip for a while. The Americans Wig Report: Season 5, Week 3: A-. Out in Oklahoma, the Jennings sport rural-glam looks suitable for the biggest TV show of 1984: Dallas. Elizabeth’s blond tresses are a knockout, but the real winner here might not be a wig at all, but Philip’s cowboy hat. The show loves making Philip and Elizabeth share the frame with pieces of Americana, but I think this might be one of its strongest juxtapositions. A lonesome Russian cowboy, longing for those Soviet planes. Was there any Mail Robot? Unfortunately, Mail Robot has not been authorized to join Stan and Aderholt on their rounds, in which they talk tough to guys who don’t want to talk—presumably about the death of Frank Gaad? Then again, having Mail Robot along for the ride would ruin Stan’s opening line, “We’re from the Federal Bureau Of Investigation, in case you can’t tell from our suits.” Mail Robots don’t wear suits, you see. Interesting moment between Matthew and Paige: When Paige expresses dismay at the messiness of the world, Matthew shoots back a “There’s nothing we can do about it.” That’s not the type of thing our crusader for nuclear disarmament wants to hear from her boyfriend, and it probably contributes to her frustration and confusion as much as the stuff with her parents. That sigh from Costa Ronin after Oleg listens to the tape packs so many feelings into a single exhale: fear, betrayal, disbelief. A nice punctuation to the scene.